The Cavaliers proved that rock can sounds good on more than just the radio, topping the first show of the 2007 Summer Music Games, held tonight at the Navy-Marine Corps Memorial Stadium in Annapolis, Md. The Green Machine opened their season with a 73.9 for their show "And So It Goes," featuring the music of Billy Joel. The Cavaliers' director Jeff Fiedler said that his corps had a very energetic performance tonight. "The last couple days have been really good for us. The intensity among corps members has hit a crescendo," said Fiedler. "They've stepped up, the staff has stepped up, and we've really put a good performance out on the field tonight. It may be one of our most energetic first performances in quite some time." The Bluecoats were close behind at 71.6 and sported a new look to go with their 2007 offering, "Criminal." 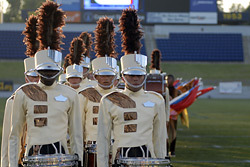 The Cadets' "This I Believe" took the bronze medal with a score of 70.7. Carolina Crown, also in new uniforms, scored a 70.35 with their tribute to horse racing in "Triple Crown." Fans tonight voted Crown's brass section fan-favorite after a new text message voting promotion was launched to fans in the stadium. 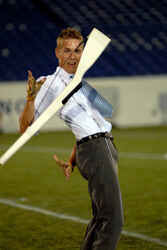 Listen to Carolina Crown Program Coordinator Jim Coates talk about the corps' performance (MP3). Glassmen's "Gitano" scored a 61.85, and Spirit from JSU, the third corps of the night in new attire, rounded out the night with a 60.9 for their show "Genesis." "Corps this season are stepping up and taking the time to prepare their students over the winter and through the pre-season," said Fiedler. "You can hear that coming through on the field, and it's great because it makes the activity that much better." View a complete scoring recap.